How common is it that you come across dessert recipes with less than five ingredients? 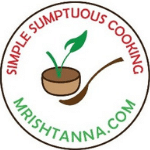 At Simple Sumptuous Cooking, it is not that uncommon and today’s Vegan Mango Mousse is a good example. A Mousse that is vegan-friendly, calorie friendly and tastes friendly too! I did not have to use any gelatin or agar-agar for this recipe and I nearly finished without any added sweetness, but the mangoes turned out to be sourer than I imagined. So I had to add a little bit of sweetener (Agave Syrup) to finish it off. Mousses are typically made with whippedÂ white eggs. Apart from the cruelty it brings, that is a lot of animal-based cholesterol. Enough to negate all the workouts you had done in the past couple of days! So, try this vegan version with much less saturated fat from coconut cream than the non-vegan version. Preparing it cannot be any easier. Just be sure to refrigerate the coconut milk ahead of time and use just the cream that settles on the top instead of the entire can of coconut milk. You will need 2 cans of coconut milk to get 1½ to 2 cups of coconut cream. When you are done, just refrigerate them for a couple of hours or more to get a denser consistency and texture. 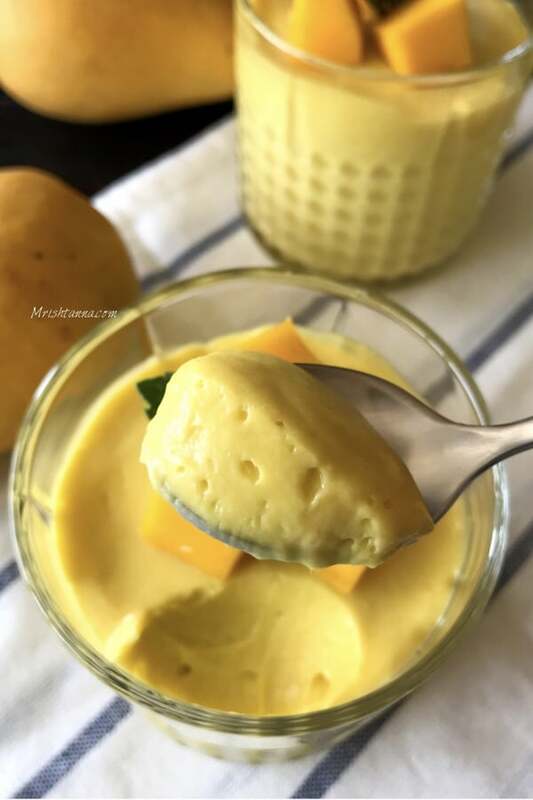 Mango Mousse is vegan-friendly, low on calories and tastes better than the non-vegan version. One of the easiest recipes with excellent results. Even kids find it easy to prepare this delicious mousse. This vegan mousse not only has a perfect texture but its taste and flavor are also amazing. This mousse is thick, rich, creamy, dairy-free, sugar-free and is suitable for vegans. A very easy no-cook vegan mousse recipe using naturally set coconut fat. No need to use gelatin or agar-agar and usually there is no need for added sweetness. Â If the mangoes are sour, a little bit of sweetener (Agave Syrup) is required. The most delicious dessert based on coconut milk and mango pulp. An instant hit in parties. When I made this dessert for my guests, they became a huge fan and wouldn’t stop complimenting me. 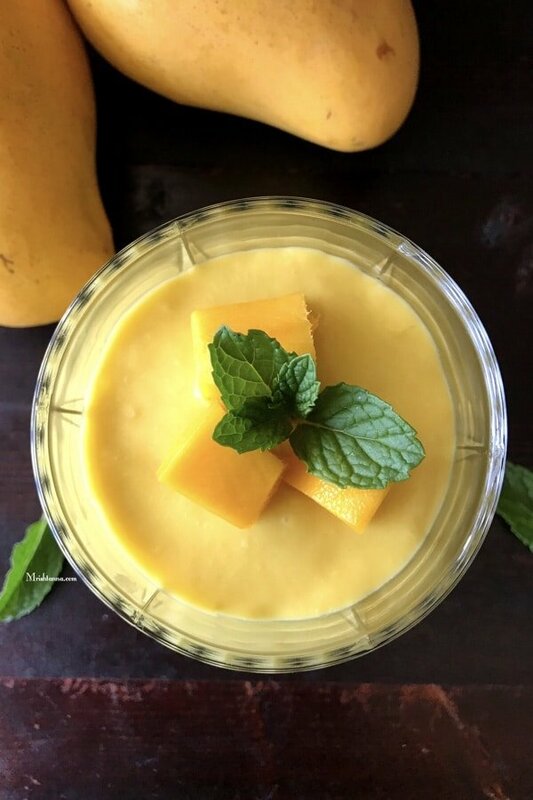 Kids especially will fall love in with this vegan mango mousse. Sweetened mousse is served as a dessert, or used as an airy cake filling too. I plan on sharing more recipes with this creamy mouse as a cake filling. If you can think of more ways to enjoy them, please let me know on my facebook page. I am always looking for more way to enjoy healthy versions of vegan desserts and to spread the message. If you like really enjoy Mousse, check out my recipes for Papaya Mousse and Chocolate Mousse. If you are a mango lover, check other mango recipes here. Peel the mangoes and dice them. Mash the dices to make a smooth puree/pulp. In a big bowl, gently add the coconut cream and whisk the pulp until it is creamy. Add Sugar or Agave syrup. Garnish the Mousse with fresh fruits or dark chocolate shavings. That's it! Refrigerate them for a few hours and serve chilled for a sweet indulgence! PS: If the mangoes are sweet, you can skip the sugar! My mangoes were a little sour, so I added agave syrup. 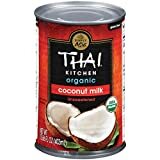 Just be sure to refrigerate the coconut milk ahead of time and use just the cream that settles on the top instead of the entire can of coconut milk. You will need 2 cans of coconut milk to get 1½ to 2 cups of coconut cream. When you are done, just refrigerate them for a couple of hours or more to get a denser consistency and texture. 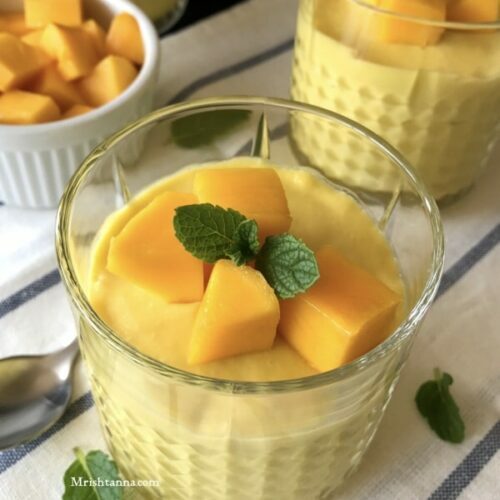 This Mango desert looks so so tempting, have to try this lovely recipe soon, bookmarking it thanks for the lovely share. DElicious mango mousse.. Now is the time to make and enjoy all the mango desserts. Such a simple recipe and such great results. I will be sure to try this and surprise my aunts who do not eat eggs. Amazing Vegan mango mousse, my mouth is just watering here. Who can resist to this ultimate mousse, delicious. Perfect Texture . Mango mousse looks tempting!! This gonna be so tasty I am sure, which I won’t mind having anytime. 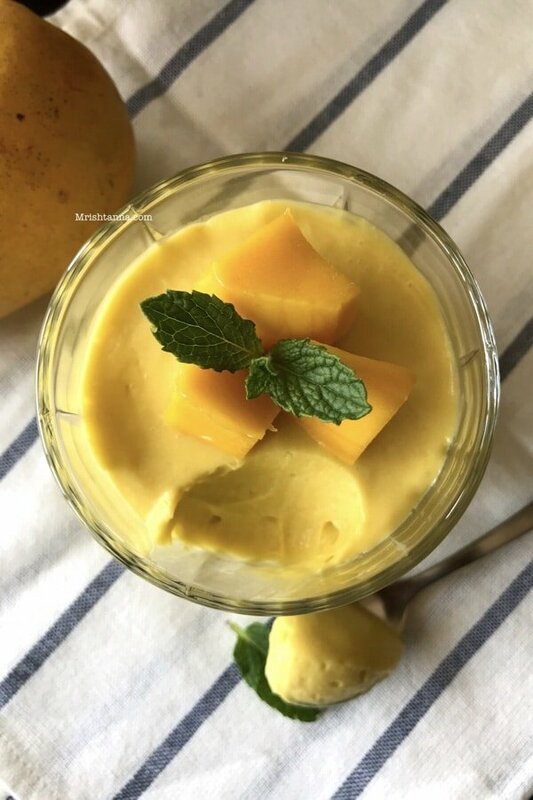 Vegan mango mousse looks very inviting and love the fact it only needed three ingredients. Such a healthy and tasty dessert. This is such a quick one and looks so yumm. Lovely one. 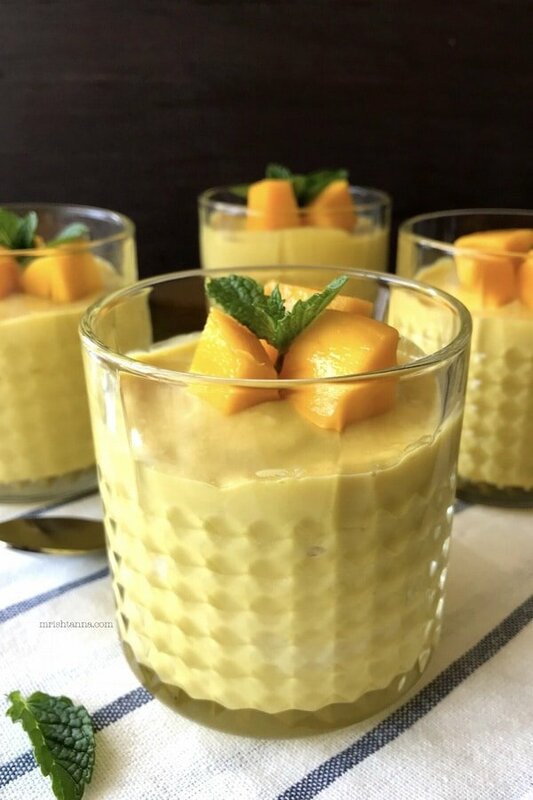 Tempting mango mousse with perfect texture…Mango desserts can never go wrong…It will be a hit in any party…Lovely recipe!! Your vegan recipes are a hit! Coconut and Mangoes are a match made in heaven and look at the creamy texture of the dessert.. No Agar Agar too. Good one Uma! I have cut up frozen mango, about how many cups should I use to equal three mangos? Wow What a tempting Mousse ! Wow, the mango mousse looks yummy! I love the texture you have been able to achieve no one will realise it is coconut cream. Hi, if I am using coconut milk powder to make the coconut milk cream, would 200 gms of the powder be sufficient to get 1& a half cups of cream? Hi Nishi Prem. You should add slowly little by little to mango pulp. When you whisk you should get thicker than smoothie consistency. To be on safe side, can we use canned mango puree to make this moose? If you are vegan for animal cruelty reasons, by all means, this is a great recipe, but please don’t spread false information on nutrition. Egg whites are cholesterol free and contain .01g of fat and no saturated fat. It also provides 7% of daily value of protein at only 17 calories per egg. Coconut cream on the other hand is 49 calories per TEASPOON, with 5g of fat, 4.6 is saturated fat, which is 22% of your daily value. While it does provide potassium (1%) it only has .5g of protein. Unless you can’t or don’t eat eggs, this is not a nutritionally wise substitute. Thank you Kris. I am vegan for ethics reason. I agree that egg whites are less fat than coconut cream. But I am not only talking about egg whites, non vegan version includes milk fat and milk cream too. 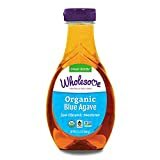 Can i put everything in my vitamix and blend it or does it have to be whisked? Hi, yes like you said you can blend it in vitamin. But please make sure it’s thick enough, otherwise it won’t set in fridge. Thank you:) Good luck! Do you mash with a fork and then whip with a whisk or are you using a blender? I mashed ripe mangoes then whipped with coconut cream. You can use the blender for whole process. 🙂 Good luck. Thank you!